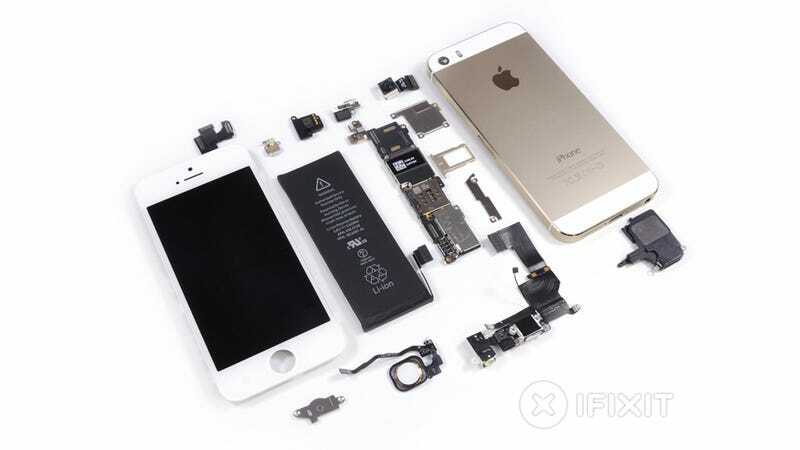 The ace team at iFixit is currently gutting the iPhone 5S, as only they can, to see what's new inside the next iPhone. What's the fingerprint scanner look like on the inside? What about all those fancy new chips? And how's that goldpagne? A cable connects the Touch ID sensor in the home button to the Lightning port. iFixit says pulling too hard on the screen could cause damage to that cable. What's interesting is that iFixit couldn't find the vaunted M7 co-motion processor. iFixit says, "As we search for a much-anticipated M7 coprocessor, we begin to wonder if it actually is a separate IC, or if it is additional functionality built into the A7." Currently unknown: who manufactures the A7. iFixit rates the repairability slightly lower than the iPhone 5.